Prometheus was the Titan god of forethought and crafty counsel who was entrusted with the task of molding mankind out of clay. His attempts to better the lives of his creation brought him into direct conflict with Zeus. Firstly he tricked the gods out of the best portion of the sacrificial feast, acquiring the meat for the feasting of man. Then, when Zeus withheld fire, he stole it from heaven and delivered it to mortal kind hidden inside a fennel-stalk. As punishment for these rebellious acts, Zeus ordered the creation of Pandora (the first woman) as a means to deliver misfortune into the house of man, or as a way to cheat mankind of the company of the good spirits. Prometheus meanwhile, was arrested and bound to a stake on Mount Caucasus where an eagle was set to feed upon his ever-regenerating liver (or, some say, heart). 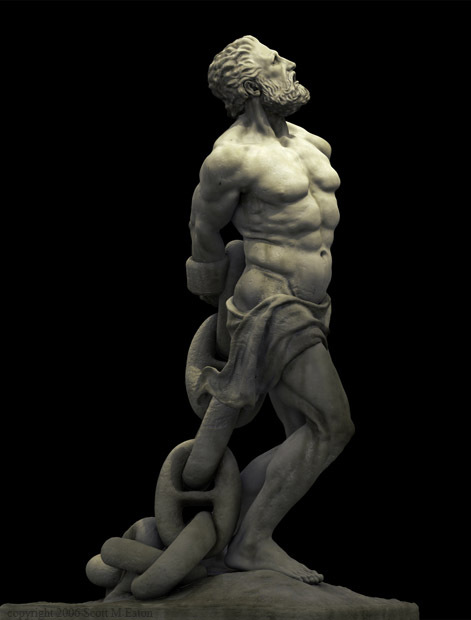 Generations later the great hero Heracles came along and released the old Titan from his torture.